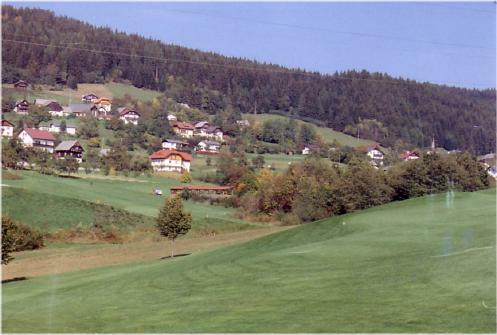 Austria has some of the most scenic golf courses in Europe. Several of them are developed by world-renown pro Bernhard Langer of Germany. 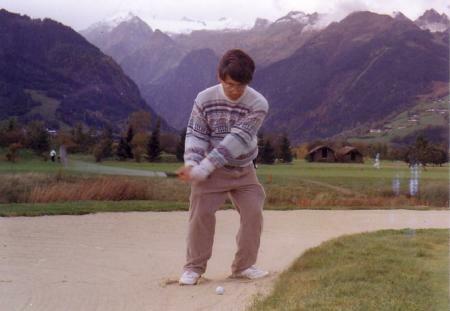 Golf in Austria brought us to enchanting towns like Velden, Zell am See, and Seefeld. 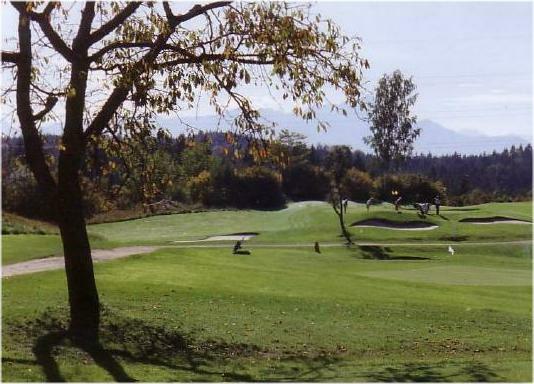 Golf Course at Velden, Austria. 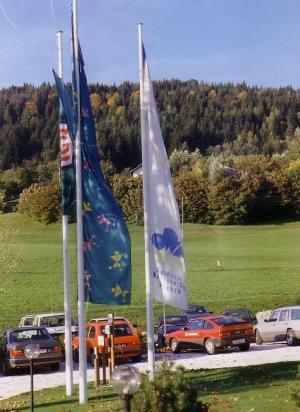 The Velden (pronounced Felden) course is several miles outside the town. The easiest way to get there is by car. But I rode the city bus and walked a bit. 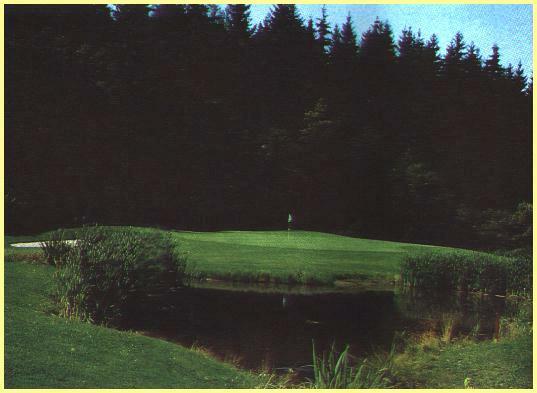 The green fees were quite reasonable, $45 (in 1993). Blue, red, white, and gold tee markers were arranged from short to long. Distances were marked in meters instead of yards. I added about 10% to get the yard measurement. What's "400 meters divided by 1.1?" Nevertheless, I really enjoyed playing this beautiful hilly course. I had hope Julie Andrews would come out and sing the "Sound of Music". Eighteen-hole Schmittenhöhe and 9-hole Kitzsteinhorn are situated in a relatively flat valley, surrounded by the majestic Tyrolian Alps. The 18-hole golf requires a minimum handicap of 35 before they let you play, which can either be a golf instruction certificate or a golf club membership card. I handed them my Northern California Golf Association card, which they accepted. Mt. Kitzsteinhorn peak is shown in the background. 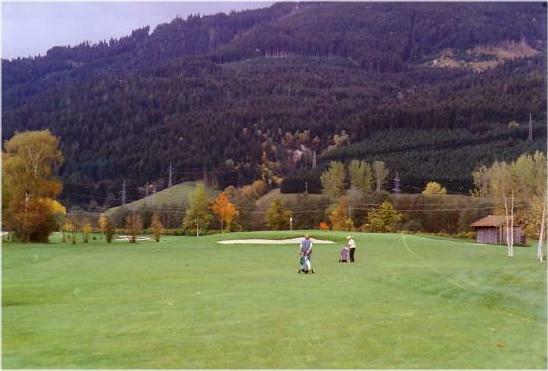 I played with an Austrian member of the Zell am See golf club and a man from Germany. Both of them spoke passable English, so I enjoyed playing and chatting away with them. 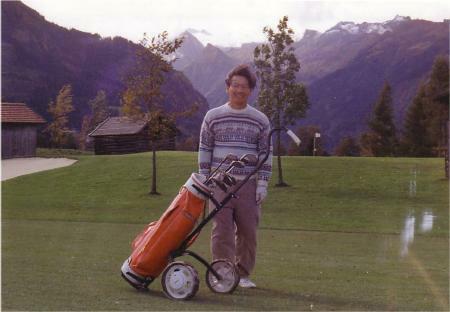 When they found out I was playing golf on my first visit to Europe, it surprised them. I responded, "Why not? ".